The Bride of Frankenstein. 1935. Dir. James Whale. Screenplay by William Hurlbut. Starring Boris Karloff, Elsa Lanchester, Colin Clive, Valerie Hobson, Ernest Thesiger, Gavin Gordon, Douglas Walton, and Una O’Connor. Universal Pictures. For my earlier Blu ray review of James Whale’s original Frankenstein click here. I can tell you one thing off the bat – I really could have done without Gavin Gordon’s eloquently rolling speech as Lord Byron in the opening scene. Really love how the film starts, I just cannot handle his dialogue. It nearly prompted me to fast forward, but I rarely ever do that. Plus, if I did that I would’ve missed a beautiful shot I love: as the present day gives way to the story’s plot, starting after The Monster has apparently died and fire burns, the camera pulls away from Lord Byron, Percy Bysshe Shelley, and Mary Shelley while they all talk about her story Frankenstein. This shot slays me. It is as beautiful as anything you could ever see. The camera hauls back, transitioning to the story, and while it does we see the room grow larger and larger, looming around Byron and the Shelleys. There’s a haunting quality to it. The Bride of Frankenstein for me is almost better than its predecessor. It has to do with the fact I didn’t particularly care for a lot of the changes the first film made to Shelley’s original novel. 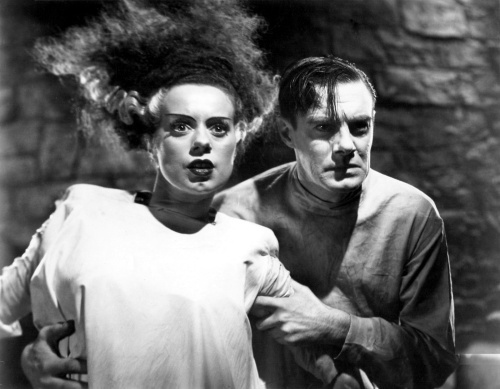 Where The Bride of Frankenstein is itself a new story, inspired by parts of the original novel and of course the film before, it thrilled me more because it was James Whale taking on fresh material; essentially, building on his vision of Frankenstein further. There is a little bit more hamming in regards to acting. You can’t let that take away from this film. In 1935 there was still, naturally, a lot of reference to the stage. Film was not exactly an old medium. Many actors no doubt relied on their training as stage actors in plays or musicals, whatever, to guide their performances on film. The one performance which I really can’t stand (aside from the irritating portrayal of Lord Byron in the opening scene, which I can forgive as it isn’t long) is that of Una O’Connor who plays Minnie. She was apparently a favourite of Whale’s, and supposed to be comic relief from what I gather. However, this film could have, and would have, worked just as well with no overbearing comedy, which is exactly what O’Connor provides. Her shrieking and wailing does nothing for me. I hated every minute of it. I particularly hate her overreaction to meeting The Monster, just moments after he has grimly dispatched a couple people (that part is actually crazy for the time). O’Connor’s reaction to The Monster is so over the top it pains me to watch. It could’ve been a really frightening moment. Instead they go for a real gag almost. May as well have been Curly, Larry, or Moe instead of Minnie. Aside from O’Connor, however, I really enjoy a lot of the other performances. Clive, again, is a good Frankenstein, albeit still named Henry of course. Ernest Thesiger comes as a great addition to this sequel. He plays the part of Doctor Septimus Pretorius, who is the former mentor of Henry Frankenstein. His performance is more than adequately creepy and quirky. Not only that but the inclusion of the character provides a particularly memorable scene for The Bride of Frankenstein when Pretorius shows his protege a bunch of miniature people he has created, homunculi, such as a king and queen, and more. For the time, especially, this one scene was incredibly innovative. Today we take those things for granted. In 1935, showing a doctor displaying a bunch of tiny people in snowglobe-like encasements, moving around and talking, et cetera, was incredible. It looks flawless. On Blu ray this scene looks really incredible, the picture is beautiful and it would be hard to imagine someone not being able to appreciate it. 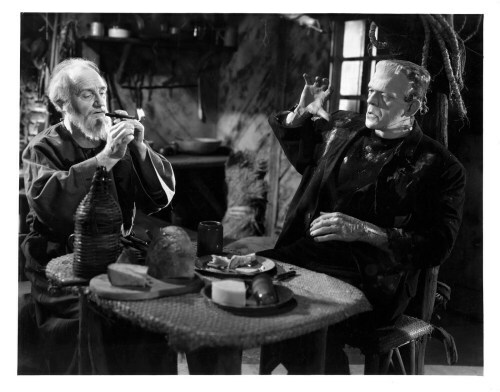 One of my other favourite scenes from The Bride of Frankenstein is the meeting of The Monster and the blind hermit. The Monster wanders into his home because the man is playing the violin; he does a beautiful rendition of “Ave Maria”. This scene looks wonderful, as does most of the film, but it’s also emotional. The two meet and become friends. The blind man identifies with the grunting man-monster; neither of them are working with their full faculties. Of course it doesn’t last long. While it does, though, it is spectacular. 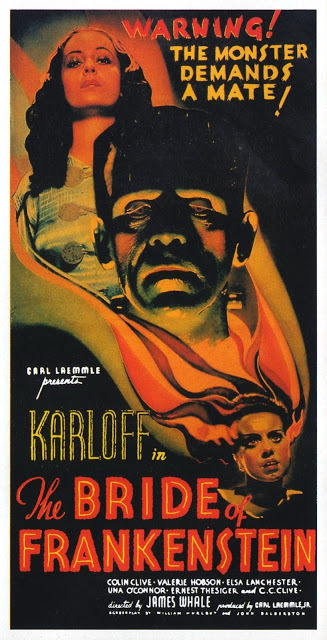 Karloff again does a great job of subtly portraying The Monster as a misunderstood and confused character. He truly was one of the greatest actors. In the first film he did a magnificent job, here he is able to expand upon that characterization, and really makes The Monster a good tribute to what I believe were Shelley’s intentions for him in the original novel. They fit very well together. Also, this pairs well with Elsa Lanchester’s portrayal of The Monster’s eventual life partner, which is a sight to behold. Though The Bride of Frankenstein Blu ray doesn’t have as many features as the first film’s release by Universal Pictures, there is still a great featurette (featuring the ever-knowledgeable Joe Dante) called “She’s Alive! Creating The Bride of Frankenstein“, which examines all sorts of aspects related to the film. This includes interviews with a bunch of people, such as Bill Condon and and great narration by Dante. I really enjoyed this small documentary. The focus honed in on James Whale in particular. Everyone discusses The Bride of Frankenstein, but touches on his other horror films, and the incredible visionary outlook he had. Also included on the Blu ray release is some nice commentary by film historian Scott MacQueen, as well as “The Bride of Frankenstein archives” which is a lot of production stills from the film set, posters, artwork, and so on. As a film, I would have to give The Bride of Frankenstein a 4 out of 5 stars. I really wish some of the outright comedy didn’t find its way in here. They say Whale is known for his playfulness in that sense, and in other films I can totally jive with it, but here it feels out of place to me. Or maybe it’s only out of place for my taste, and that could be because of O’Connor’s performance. 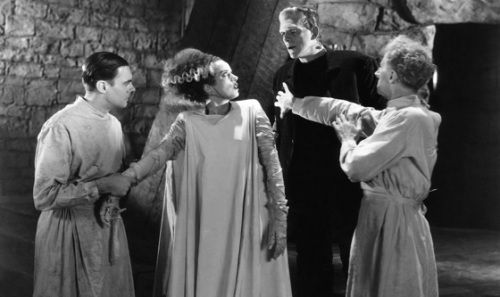 Regardless, there is a still a ham-ish quality to The Bride of Frankenstein which I don’t feel totally belongs. I know the concept is a bit out there, and perhaps due to that the slight bit of comedy in here works for some. I just don’t necessarily believe that in a horror film an out there concept needs to be treated with any sense of comedy. It’s not as if the laughs are dripping out of every scene, not even many really, but it is there, and if the whole film were played with an even more deadly serious tone it would have worked. It works as is, but that’s just my opinion on something it may have lacked. The Blu ray release also gets a 4 out of 5 stars. I really did like the special features included, but I feel like for a Universal Pictures film, one that is so adored according to most sources, there’s a lack of extras. The featurette narrated by Joe Dante is awesome, but really – they couldn’t find anything else except a slideshow of pictures over music and a film history’s commentary? I just find it strange. The Blu ray restoration of Whale’s 1931 Frankenstein has a lot of great stuff, and this just seems like they didn’t have much. Maybe there wasn’t much, but still – I find it hard to believe. Enjoyable features included nonetheless, though not as much as I would’ve liked. The picture itself is unbelievable. Whale’s film uses setting and atmosphere, as well as makeup and lighting, to really make its story work. There are beautiful and horrifying moments, sometimes all wrapped into one, throughout the film. The mood is set completely through how Whale makes everything so grim and gloomy. The Blu ray definition makes this classic truly worthwhile. Especially if you have never seen the film, you will be blown away at how gorgeous the picture quality looks here in this release. You’re able to capture all the shadows and the creepy lighting and the terrifying makeup in such beauty here. Really an incredible job. Anyone who has yet to see this film, do check it out as soon as possible. It is no doubt a classic. However, don’t feel like it’s untouchable. Classics aren’t perfect just because they’re classics. No matter, The Bride of Frankenstein is a beautiful horror film worth watching, and will always remain a classic.